You bought a house with exterior rigid foam, and you just discovered that the foam is too thin — so now what? 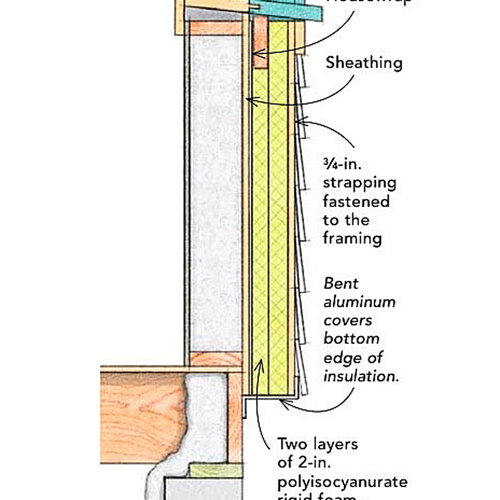 If your house has 2x6 walls, the approach shown in this photo — installing R-5 rigid foam on the exterior side of OSB wall sheathing — won't work in Climate Zones 5, 6, 7, or 8. You'll need thicker rigid foam to prevent moisture problems in your walls. Let’s say you’ve owned your house for several years. Your growing interest in energy efficiency brought you to the GBA web site. GBA taught you that it’s a great idea to install rigid foam on the exterior side of your wall sheathing, as long as (a) the rigid foam is thick enough to keep your sheathing above the dew point during the winter, and (b) your walls don’t have any interior polyethylene. You think to yourself, “That’s interesting. I wonder if the walls of my house have any exterior foam.” So you poke around. Maybe you lift some vinyl siding. Maybe you make an inspection hole in a closet wall. And you discover that (a) your walls have R-5 exterior foam, even though you need at least R-11.25 rigid foam for your Zone 6 walls, and (b) your walls include a layer of interior polyethylene. 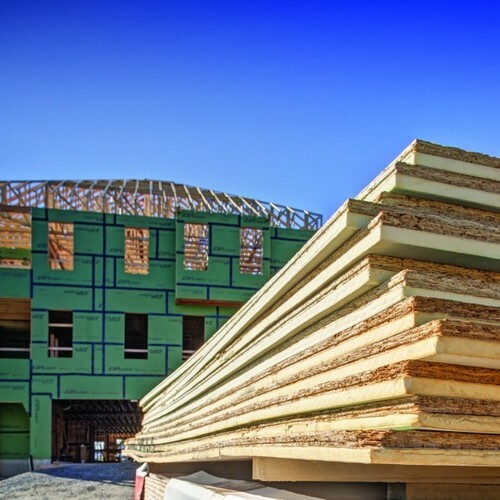 If you’re planning to build a new house with exterior rigid foam, you should follow the rules outlined in a GBA article titled Calculating the Minimum Thickness of Rigid Foam Sheathing. That way, your foam will be thick enough, and you won’t have any interior polyethylene. Then you’re all set. If you’ve inherited or purchased a house with too-thin foam, though, the fix isn’t easy. The “fix everything” approach is so expensive that few homeowners will go this route unless they are already planning a gut rehab job and new siding. I think this may be a case of much ado about nothing. The majority of the homes built in my area (zone 6) have a minimal amount of rigid insulation 1/2 or 1" with an interior poly vapor barrier and have been built this way for 20+ years. I have taken a lot of these apart and have seen very little evidence of degradation in the osb sheathing except for rot caused by bulk water flashing errors. Rotting sheathing is just not there. As I'm sure you noted, my article does not advise homeowners to start ripping into their walls. Rather, I provide advice for homeowners who either intend to do nothing or who are planning to replace their siding. Test hut studies show that sheathing that is protected with rigid foam of insufficient thickness gets damp in late winter and dries much more slowly than sheathing without exterior rigid foam. In general, that's not good -- but as my article notes, and your observations confirm, sheathing rot is rare. See below for info about 2x6 walls with R-5 foam sheathing working in cold climates. 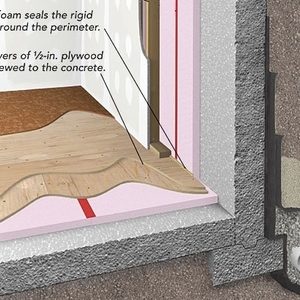 The Lstiburek article that you linked to includes an important caveat: "Let me remind everyone once again that the key to these walls is the airtightness and vapor tightness of the interior lining. If you don’t have an interior air barrier and an interior vapor barrier, your exterior vapor barrier is going to have to have a lot more thermal resistance to control condensation." In other words, these walls work if there is interior polyethylene and if the interior walls are fairly airtight. Under other circumstances, these walls can fail. So builders of new homes should continue to follow the rules -- because we want our walls to be robust, even when errors occur. Now you have confused me. The article suggests one approach would be to remove the interior poly. The quote from Joe L's article suggests the walls need an interior air and vapour barrier or they risk failing. The lack of an interior vb would aid drying, but Joe seems to imply there is a significant portion of the wetting that comes from diffusion, not air-leakage - which is something I thought wasn't commonly held now. I agree, although I expect that anything built recently would be better air sealed than most homes built 40 years ago. My guess is that an under-foamed wall would be even more robust with cellulose and Intello. The problem comes when a builder adapts only half of standard recommendations. Mixing & matching two different approaches makes things complicated. If the wall has an adequate thickness of rigid foam for the relevant climate zone, the wall will be robust. It won't need an interior vapor retarder, because there is no risk of condensation, and inward drying during the summer is potentially valuable. If the wall has foam that is too thin, there is a risk of condensation in the wall assembly (or moisture accumulation in the sheathing). Two ways way of slowing down the flow of interior moisture toward the exterior during the winter are (a) establishing a good interior air barrier, and (b) having an interior vapor barrier. The interior polyethylene reduces the risk of condensation, but at the cost of less inward drying during the summer. According to Lstiburek, when a wall includes exterior foam that is too thin, the advantages of the interior polyethylene outweigh the drawbacks. That's not to say that too-thin foam + interior poly is a robust assembly; it's just to say that it kind-of, sort-of, works -- although not as well as a wall with foam that is adequately thick. Thanks - nothing to unlearn then. That's good, I'm not sure how many more new building science twists I can take in. It reminds me of the cautionary tale in Tom Sawyer. "How many of my readers would have the industry and application to memorize two thousand verses, even for a Dore Bible?... and a boy of German parentage had won four or five. He once recited three thousand verses without stopping; but the strain upon his mental faculties was too great, and he was little better than an idiot from that day forth—"
I've biked to work every day this year and counted 23 homes getting new siding and that useless quarter inch accordion folded foam and tape going on first. I wanted to stop and hit them upside the head with a 2x4 but decided the cig hanging from their mouths would do them in before the owners would see the poor results. Twain always had it down to the "T" in every unscrupulous human endeavor! Let's just hope those homes continue to leak like a sieve to keep them drying out. That fan-fold stuff isn't usually about R value, it's about providing a flatter surface + WRB in one in re-siding projects. The facers on the fan-fold determine it's vapor retardency, but is (with very few exceptions) still in the Class-III range. That doesn't present a significant drying hazard, and taped fan-fold DOES protect against exterior moisture drives & direct wetting. It's not exactly "useless", even though it's not exactly great either. While I'm not a fan of the stuff, it isn't creating a problem, and does provide a measurable uptick in thermal performance. On typical 2x4 framed houses even the 1/4" inch stuff delivers a low double-digit percentage reduction in U-factor. To be sure, stapling up some fan-fold on a 2x4 wall in a re-siding project instead of more substantial R is an opportunity moment lost. Thin rigid insulation over 2x6 fiberglass with poly works. Here in northern NY or Canada I rarely see walls built any another way. Sad really. I like rigid insulation that is why I put at least 2" of the stuff on every home I build. I am still confused as to this exterior sheathing moisture argument. The computer modeling doesn't seem to reflect real world experiences or nobody seems to think it pertains to them. Guys building double stud walls seem to perfectly content to have sheathing with really high moisture content, supposedly it dries in spring. The classic double vapor barrier wall described by John above has been built a million times and it seems to work just fine. Is this just a case of Wufi gone wild? I love hearing reports from builders as to measurements and experiences with newer wall assemblies. Fun stuff. Last December a fallen tree limb had taken an eave so we had to pull some of the vinyl siding off to check on damage. New siding and of course there was the pink 1/4" xps underneath. The backside of which was dripping wet like it had a hose shower. Keep in mind no rain for a week, no snow yet. The night before it was in the low teens and when we were there it was about 26F. The house probably heated up the wall that afternoon and internal frost was melting. Old house and most likely very leaky so I told the owners no problem it should dry just fine (siding one year old and no signs of rot)... but will it? I'm confused why you're saying it's specifically interior polyethylene that must be lived with (absent adequate exterior foam.) The code says you have to have a class I (such as polyethylene) OR class II vapor *retarder* in CZ marine 4 thru 8 if you don't have adequate exterior foam. The kraft facing on fiberglass batts is class II and from what I have seen is commonly used as the interior vapor control layer, in lieu of polyethylene. (I suppose I'm speaking mostly from a CZ4 and CZ5 perspective on that.) The subtleties of vapor "retarder" vs "barrier" is something that has been much discussed in this blog before so I'm surprised that didn't come up here. I know you're talking about best practice, not just code, but, as you say, the vapor *barrier*ness of polyethylene introduces other moisture risks by stopping inward drying. Is there not-just-WUFI-says-so evidence out there that polyethylene does a better job making a cold climate wall safe from condensation despite it's downsides, *over* some other class II vapor retarder, that just didn't make it into code? If we're talking absolutely best practices and thicker foam is off the table for a situation, and have the ability to put in the vapor control layer of our choosing, why not a smart vapor retarder product over straight up polyethylene? You raise a lot of questions. First, it's important to point out that following minimum code requirements doesn't guarantee that a builder has chosen a robust or safe wall assembly. If this statement surprises you, you should read The 2012 Code Encourages Risky Wall Strategies. Q. "Is there not-just-WUFI-says-so evidence out there that polyethylene does a better job making a cold climate wall safe from condensation despite its downsides?" A. I'm not quite sure that I understand your question. First, I am not advocating the use of interior polyethylene. Second, few building scientists advocate the use of interior polyethylene. Third, it is an overstatement to say the polyethylene does a good job of "making a cold climate wall safe from condensation." Fourth, any house that has air conditioning should avoid the use of interior polyethylene. These days, the use of interior polyethylene is mostly restricted to Minnesota, parts of Canada, and Alaska -- and even there, MemBrain would usually be a better choice. Q. "If we're talking absolutely best practices and thicker foam is off the table for a situation, and have the ability to put in the vapor control layer of our choosing, why not a smart vapor retarder product over straight up polyethylene?" A. For a new home without any exterior rigid foam, you are right: MemBrain is preferable to interior polyethylene. Here's what GBA has always advocated: (a) If you want to install exterior rigid foam, make sure that it is thick enough to keep the exterior sheathing above the dew point during the winter, as explained in this article: Calculating the Minimum Thickness of Rigid Foam Sheathing. 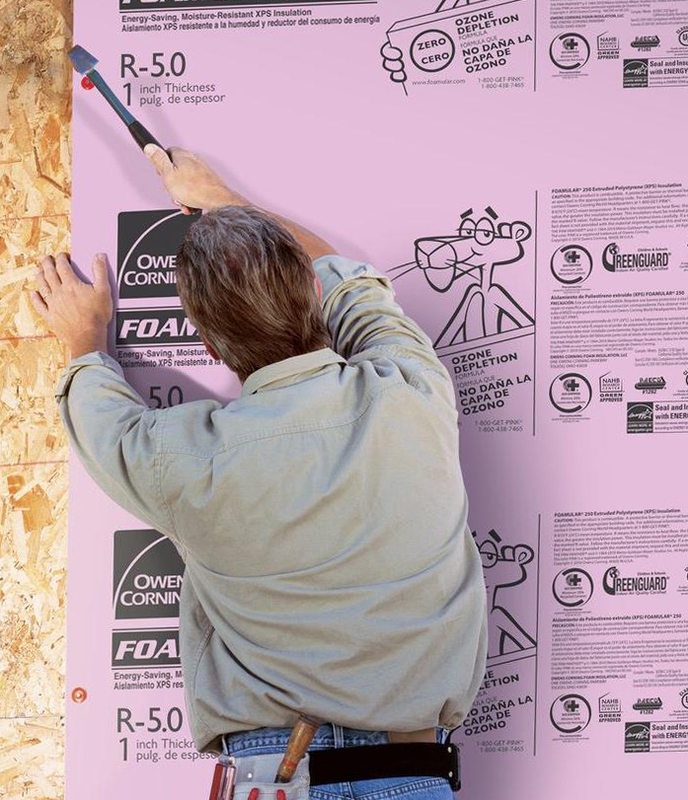 (b) If you are building a cold-climate house without exterior rigid foam, you should install an interior vapor retarder that complies with code requirements -- something like kraft facing, MemBrain, or vapor-retarder paint. The recommendations in the article on this page have nothing to do with new construction; they concern older homes that were built by builders who don't know much about building science. Martin suggests, "Fourth, any house that has air conditioning should avoid the use of interior polyethylene." Wood /vinyl /fiber-cement clad houses in climates with summertime outdoor dew points that average less than 60F/16C will have no problems with air conditioning & polyethylene vapor barriers. Very few houses in locations with summertime dew point averages less than 65F/18C would either, but above that it's pushing your luck. Even when the air conditioning supply air is cooler than 60F (~55F is pretty typical) , even a wall adjacent to a supply register the wall temperatures rarely hit the 60Fmark, and won't dwell at that temperature long enough to accumulate moisture in the wall. With 65F outdoor dew points wall temps next to a register can collect moisture, but only if the duty cycle on the AC is fairly high for days. At outdoor dew points above 65F the risk increases rapidly in climates with substantial cooling loads that extend for days/weeks at a time. Most of the eastern US is at some risk, not so much in the Canadian midwest, or any of the Rocky Mountain states & westward in the US. Even Minneapolis has fairly low risk, despite occasional midsummer weeks where the outdoor dew point averages are above 65F more than 30% the time. But places such as Boston or Cleveland or Chicago are at some risk, and points south & east thereof are increasingly more prone to problems with polyethylene vapor barriers in air conditioned buildings. Bismark ND, Denver, El Paso, and most points in between and west, all have summertime dew point averages under 55F, even in some fairly hot summertime locations, and only rarely hit the mid-60s for outdoor dew points. Houses with brick (or stucco) cladding can have HUGE issues with interior side polyethylene, even in areas with modest outdoor dew points, due to intermittently extreme dew point temperatures of the entrained air next to the brick, as sun drives drain/dew moisture out of the cladding.